WELLESLEY, Mass., Sept. 10, 2018 /PRNewswire/ -- U.S. News & World Report has ranked Babson College the No. 1 undergraduate school for entrepreneurship for the 22nd consecutive time, leading an impressive cohort of prestigious peers that includes Massachusetts Institute of Technology (MIT), Indiana University Bloomington, and University of California Berkeley, among others. "We are proud to be continually recognized by U.S. News & World Report as the leader in entrepreneurial education," said Babson College President Kerry Healey. "Our immersive, action-oriented approach provides graduates with value well beyond a college degree. Heading into our Centennial year, we believe this value will prove to be critical, now more than ever, as entrepreneurship remains the most powerful force for creating positive change in the world." Babson pioneered the field of entrepreneurial education recognizing that entrepreneurs can be made, not just born, and can be taught to think and act with a problem-solving mindset in any environment. Babson's powerful network of 40,000 alumni in 114 countries, along with current and future students, are purposefully prepared to tackle the world's biggest challenges with a relentless, action-oriented energy, and in doing so, to create jobs, strengthen communities, and generate social and global economic value. 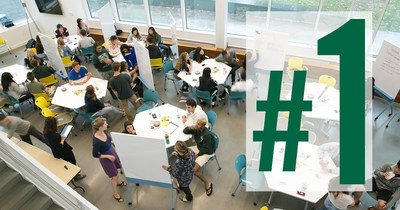 Additionally, through programs such as Babson's Goldman Sachs 10,000 Small Businesses and the Global Symposia for Entrepreneurship Educators (SEE), more than 7,000 small businesses and over 5,000 university educators have benefited from learning Babson's methodology from the College's faculty. "The more programs and courses launched, the more students reached, the greater our impact on the world. We remain steadfastly committed to extending Babson's global reach to entrepreneurs of all kinds," Healey added. "The most successful leaders of tomorrow will be those who drive positive change within any organization or community. By providing our students with an entrepreneurial skill set and mindset they will ignite innovation and be impact makers in all settings," said Babson College Undergraduate School Dean Ian Lapp. With the future of work being disrupted by technology and other social and economic forces, the global economy will be profoundly impacted through the efforts of family businesses and women entrepreneurs. More than two-thirds of businesses around the world are family-led and account for 50-80 percent of job creation in most countries and according to global consulting firm McKinsey (pdf), if women played an identical role in labor markets to that of men, it could add as much as $28 trillion to global growth. Alongside these efforts, change is being driven through a collective commitment to investing in community and the environment. Babson's Project ROI, out of The Lewis Institute for Social Innovation, finds that socially committed organizations can increase revenue by up to 20 percent and reduce employee turnover by up to 50 percent. Babson enters its second century continuing to impact and convene entrepreneurs of all kinds from around the world, while focusing on strengthening family enterprises, advancing women-led entrepreneurship, and delivering social impact at all levels of organizations to drive change and positive disruption. "Roger Babson founded our College on the premise that business should be rendered in service to humanity, and today this mindset is needed now more than ever," said Marla Capozzi, MBA'96, chair of the Babson Board of Trustees. "Our mission for Babson's next century is to bring the entrepreneurial thinking shaped by our acclaimed and dedicated faculty to more people and in more locations throughout the world." The launch of the Institute for Family Entrepreneurship, a cutting-edge hub for research, resources, and innovative programming dedicated to students from family-led businesses. The cornerstone initiative, the Amplifier, engages students and their families to foster the growth of their entrepreneurial legacy through a shared family vision. Recognition for Babson's global focus—named the No. 1 college for international students by Forbes year over year, and most recently honored with the most prestigious award for excellence in campus internationalization. The growth of the Babson Collaborative—a Babson-led-and-taught membership organization that connects institutions aspiring to build and grow entrepreneurship education programs for a better world. The expansion of Babson's edX portfolio, extending the unique methodology of Entrepreneurial Thought & Action® to more people in more places around the world. The successful launch of global hubs in Miami, which features the pioneering Women Innovating Now® (WIN) Lab, and Dubai, the College's first global footprint. The opening of the Weissman Foundry, a state-of-the-art studio fostering creative and collaborative projects led by a community of Babson, Olin College of Engineering, and Wellesley College students. Each year, U.S. News & World Report ranks undergraduate business programs accredited by the Association to Advance Collegiate Schools of Business. This reputational ranking reflects the high esteem that leaders in the field of business education hold for Babson College's faculty and undergraduate degree. The magazine surveys business school deans and senior faculty. Read more about the ranking and methodology.